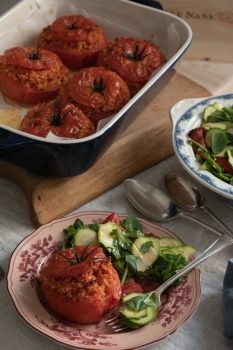 Baked tomatoes with rice is a typical Roman dish usually served with roasted potatoes. It is so popular that it can be found ready made in all grocery shops ready to be taken home and heated up. It is a summer treat but if I find tomatoes big enough out of season, I don’t see any reason why I shouldn’t make it. Start with the tomato sauce. In a deep pan heat up a couple of tablespoons of olive oil and gently fry the shallots for a few minutes, add the passata, some salt and cook on a low heat for 10 minutes. Leave to cool off a little and blend into a smooth sauce. Cut the tomatoes horizontally close to the stalk and keep the “lids” on the side. Scoop out the flesh but be careful not to break the skin or make the walls too thin. Heat another pan and add the rice. Stir it around to make sure that all the grains will warm up and start to change the colour. Once the rice is worm pour in the tomato sauce and olive oil, season with salt and pepper. Next add the basil leaves and grated cheese. Stir very well and gently cook the rice filling for a few minutes to allow the ingredients to permeate. Fill the cavities of the prepared tomatoes equally with the filling and even out the surface. Cover them with the “lids” and brush the whole tomatoes with olive oil. Bake in a preheated oven at 180 C for 50-60 minutes.